2015-11-18 - That's a Wrap! 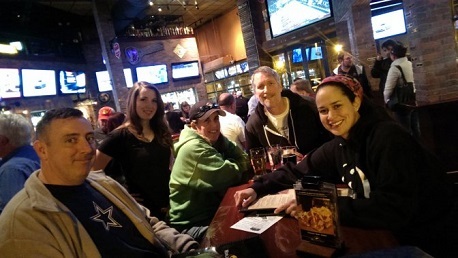 The second installment of the PubGuys Trivia League came to an end Wednesday night at World of Beer Arlington. In fitting fashion, several of the top teams from the current standings came from across the metroplex for one last shot at trivia glory. We had a great crowd, and Cobra Brewing Company from Lewisville, TX was even on-hand to pass out some prizes to the top teams. In Game One, we saw the long-awaited and triumphant return of William Shatnerface, who in proper fashion, claimed the top prize. Finishing just behind them was the always-fun team, the Mouseaholics. And, with a rare third place finish, This is Our PLC. For the Power Hour, and angry with their third place finish in Game One, This is Our PLC stormed out of the gates and never looked back. They claimed the top spot, while the Mouseaholics finished as the bridesmaid once more. It was a fantastic finish to another successful league season. We will be making some changes to the structure of the league for our next go-round, but if you have any feedback, we'd love to hear it. Simply email us at trivia@pubguys.com and let us know what you think. As a reminder, there will be no trivia next Wednesday, November 25 for the Thanksgiving holiday. Instead, we'll see you back at the World of Beer in Arlington on December 2 for your favorite weekly dose of trivia. In the meantime, don't forget to follow us on all the maojr social networking sites, and stay tuned for the PubGuys Bowl Challenge through ESPN. Links and invitations will be coming soon. It's free to play, and the winner will receive a WOB gift card.